WELCOME TO 5 TIMBER RIDGE DRIVE LAUREL HOLLOW This stunning 2 flat acre expanded ranch is located in the heart of Laurel Hollow Nestled between Moores Hill and Cove Road. Built in 2006 This lovely property boasts quality construction and the finest finishes throughout. A graceful circular driveway leads to this 3800 sq ft home with dramatic double height foyer and massive open floor plan for all your entertaining needs. Entertain guests or relax with family in the generously sized living room and dining room great room with gas fireplace 20x20 gourmet chef's kitchen with sunny breakfast area and outside entrance. In addition this home offers a large office with custom wood cabinets a large guest suite with private bedroom full bath and large living area totally separate from the other 3 bedrooms. Master suite boasts a large new custom Walk In Closet master spa shower system and custom newer carpeting. French doors lead to backyard and newer brick patio with views of lush landscaping and recently updated tennis court. 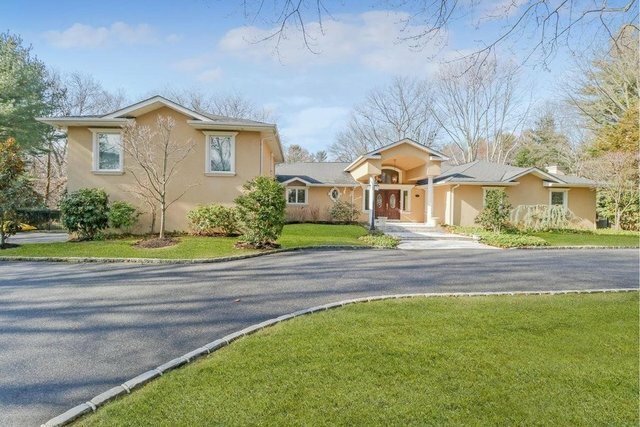 5 Timber Ridge Drive is located in the Oyster Bay School District and served by the private Laurel Hollow Police Force. Convenient to all from shopping and dining to highways and more. Some recent renovations include Entire Home Generator 2016 New Driveway Black top 2015 Master Bathroom with custom steam shower 2015 Carpeting in Master Bedroom 2015 Side yard and backyard brick pavers 2015 Tennis Court resurfaced 2010 Gas fireplace conversion 2015 Call Lisa Bossio at 516 445 0454 for more information or a private showing.